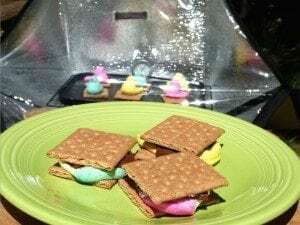 Saw this cute twist on s’mores using marshmallow chicks and just had to make them! However they are made, they are always a crowd favorite! Place one marshmallows per graham cracker on a baking tray in the Sunflair® Solar Oven until warm and gooey. Remove tray, place a wedge of chocolate on top of the marshmallow and sandwich with another graham cracker on top. Enjoy the melty goodness! !